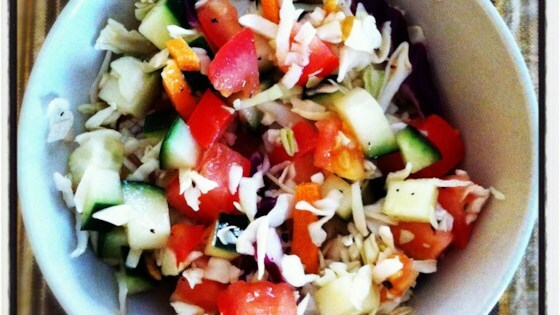 "This vinegar-based slaw is an easy way to start a meal. Very refreshing in the summer! Pairs great with fish, dishes with avocado, and Central and South American dishes. Try apple cider vinegar or white vinegar for variations in flavor. Can be served immediately or marinated in the refrigerator overnight for a more pickled taste." So nice and fresh! I did not change a thing! Quick and Easy and has an amazing flavor. I would add nuts next time for texture, but - it was a hit all by itself.